„PET Baltija” Jsc. is founded in January, 2003. The company is specializing in used PET (polyethylene terephthalate) bottle secondary recycling by producing high quality PET flakes. The company started the recycling process of PET bottles in 2004 and the production premises were in Riga then. In 2008 the company moved to Jelgava where a new production line was installed by co-financing of European Union. The company is working in a continuous regime at the moment, its recycling capacity is about 24 000 t of PET bottles a year. The company is cooperating with both – Latvian and foreign used packaging collectors and suppliers. „PET Baltija” is the biggest company in the Baltic States in its field and it is the only this kind of recycling company in Latvia. There were two Latvian annual awards received in 2011 – “Gazele” (“Gazelle”) for finance achievements in 2010 comparing to indicators in 2009. And the winning award in the Latvian nomination – “The major exporter” for achievements in 2010. "PET Baltija" started recycling PP/PE caps by producing high quality grinded PP/PE in 2015. 2) IV level increasing of PET pellets. The operations of the company are aimed to become the most proficient PET recycling company in Northern Europe with the most demanded production. „PET Baltija” Jsc. is a part of „Eco Baltia” group of companies. 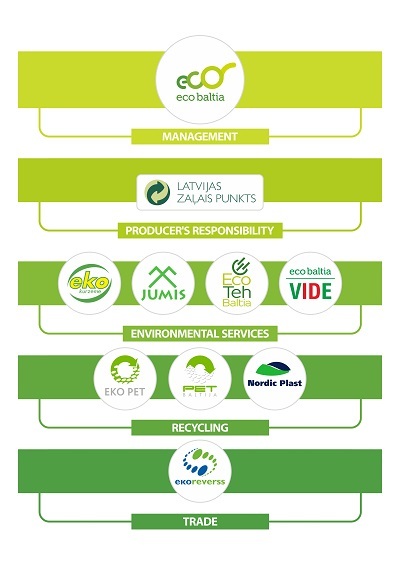 „Eco Baltia” is the major environment management company group in Latvia that unites 10 waste management, raw material collection and used packaging recycling companies.